Ah, First Experiences. This weekend Julia had a first, a piano recital!! 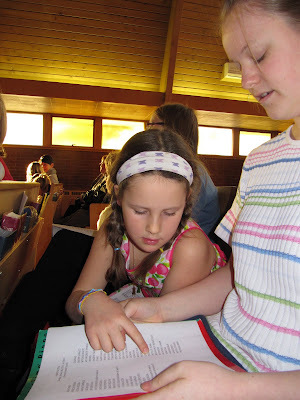 I recall my own piano recitals so vividly that I WAS nervous as i sat in the pew awaiting my - i mean - HER turn at the keys... :) She did beautifully, as I knew she would. We were able to sit with her teacher, who also played a piece (since it was her recital as well). FUN! My little outdoors girl fell asleep half way through our trek. It was so sweet, that she was comfortable enough in the snow and cold to lay herself down in the sled and fall asleep. My heart was warmed. We brought hot chocolate and cinnamon buns for a mid-trek snack . YUM!!! The tee-pee made a lovely shelter for our stop. I stumbled upon Sam teaching Mercy "how to play the piano", and crept up to capture it on camera! The hike this morning was lovely. Crisp, clear, quiet. we were the only people in the entire habitat area. hot chocolate and chocolate bar in bag, we followed a trail never taken before, fell through some ice (doesn't that sound dramatic? it was only a couple inches deep! haha) and now we are all sleepy. I am having a camera problem, and my napping husband will be able to fix it when he is more conscious. So, you will need to use your imagination to see the lovely royal purple felted bag that i FINALLY got around to felting today, after a week or so of staring at it! :) hahaha. I LOVE IT. it has a few imperfections, but i still love it a lot a lot a lot. my favorite picture from today's hike in the snow. *Ah* An hour and a half of clear skies, white trails, peaceful conversations, crisp air, and the occasional friendly hikers/skiers makes for a terrific way to start my saturday. *sigh* Talk about boosting the "happy" and the "energetic" factors of my brain... a great walk in the woods certainly remedies my dullness of spirit. I have always been this way, but i guess i forgot for a little while and let other priorities take the place of woodsy walks. Here is my mental note, a little reminder to myself that i need to get out in the beauty of God's creation a lot more than i have of late! *sigh* isn't it LOVELY? These photos do not do justice to the glorious view of snow on conifer trees, silhouetted against a blue winter sky. The photos cannot convey the children in their excitement as they find tracks in the snow and then discuss what critter could have left them. Then of course there is the excessive snow eating, which i did not photograph because I try to discourage it when we are too close to public places or dog-walking areas... The older two can pick clean snow, but Mercy has NO CONCEPT of clean or dirty... I discovered her eating a chunk of snow from the schoolyard yesterday, it was laced with leaves and dirt... ik. Five children between the ages of 3 and 7 enjoyed sleeping together in this cozy place for three nights during our V.O. Family get together! :) Maybe next year the two little girls will get to join the others... but this year they shared a bedroom to themselves. :) What fun! We are so happy to provide a place for our kids to create meaningful memories. Here the kids prepare for "movienight". Sam playing with his monsters and machines.. hahaha. Sooooo adorable. man. i love this kid. Beautiful Big Kid. and her precious dolly.